The possibilities are endless with our expertly-designed direct mail and digital ads. Create campaigns from templates or get professional creative assistance. 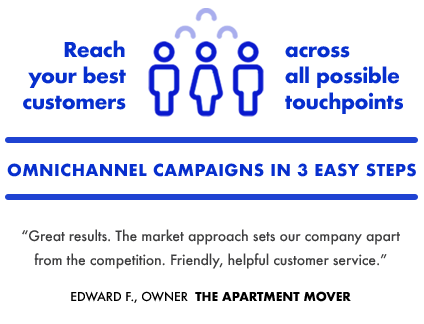 Reach new prospects or communicate with existing customers: direct mail, digital ads, emails, it’s all covered. No Post Office® dropoffs. No busy work. Quick, easy, done. "Successful businesses make vast impressions through integrated marketing channels: direct mail, social media, email, mobile apps, etc. We wanted to make all those options available, but make it quick and easy. That was our target, and I’m happy to tell you, our platform nails it." Our clients own small businesses, run large corporations, operate national chains, and span every major industry. And, they all face the same question: what’s the best way to market my business effectively and affordably? And do it easily, without using a ton of my time? The simplicity and power of the platform, combined with the creative and marketing punch of the Taradel team, is all you need to supercharge your marketing efforts. "10 Fastest Growing Marketing and Advertising Companies"